For some, the mere idea of painting a room strikes fear into their very heart. It conjures up visions of yards and yards of that infamous blue tape, and gallons of paint tipping over beautifully cleaned carpets on accident. Yes, we have all had painting mishaps, but it's not as overwhelming as it may sound. Here are some simple ways to get started when you are considering painting a room. Get your supplies (and double check them): There's not much worse than beginning an enormous project only to keep making trips to the hardware or paint store! Gathering them at the beginning helps immensely. Here's a shortlist of the items you need: paint (obviously! ), paintbrushes and rollers, painters tape (get the brand name kind that peels off easily, such as Scotch blue), a small container for paint that you can easily hold (like a tupperware), paint trays, stirrer sticks, gloves, spackle material for any small holes, dropcloths (and regular, cheaper masking tape to affix them to the floor). We also recommend rags, paint remover, and paper towels, as well as a trash bag or can. To calculate how much paint you may need, the general rule is 400 square feet per gallon. It is wise to get additional paint, in case you spill any, or you need more to cover a tough color like red. If you are using a very large amount of paint, it is recommended to mix two gallons together it in a 5 gallon bucket to prevent variances in color from being very obvious when you change buckets. Make sure you have adequate ventilation, including fans: Wear a mask if you need to, and be sure to open windows/doors to avoid breathing in paint fumes. Many paints these days are fume-free or low-odor, but you may still get a headache from being in a cramped area and painting. Work from the top down, so paint the ceiling first. If you are up on a ladder, us a small bucket or container: Going up and down a ladder is certainly not a pleasant experience, and also wastes a ton of time. Pour your paint into a smaller bucket to do trim and more detailed painting, rather than walking around over and over. We recommend using a brush along trim and to "cut in" (the first strokes along the edges), and then swapping to a roller to cover more ground. For more tips, be sure to check out our post about choosing a paint color HERE! If you know me, you know that I keep moving all day long. From planning our meals, to taking my girls to and from activities, work, or date-night with my husband, I so often seem to come home exhausted. Don’t get me wrong, I love to stay active! But some days I need to just come home and relax. That’s why I love the farmhouse aesthetic. When I walk into my living room, it’s like walking through a time machine to a simpler time. It’s a calming nostalgia that instantly relaxes me. It takes a beautiful pairing of muted, natural colors and rustic furniture style to achieve this restful, cozy feel, but with some planning it’s becomes an easy process! The pros use paint that costs upwards of sixty dollars a gallon, but you don’t need an expensive hue to look professional! Here are a few colors that will transform your home without breaking your bank. Off-white: I love the dining room above! The modern furniture perfectly compliments the rustic architecture, and the off-white tone pulls the room together beautifully. Just look out for the undertones, otherwise you can end up with a white that has a darker hue than you’d like. 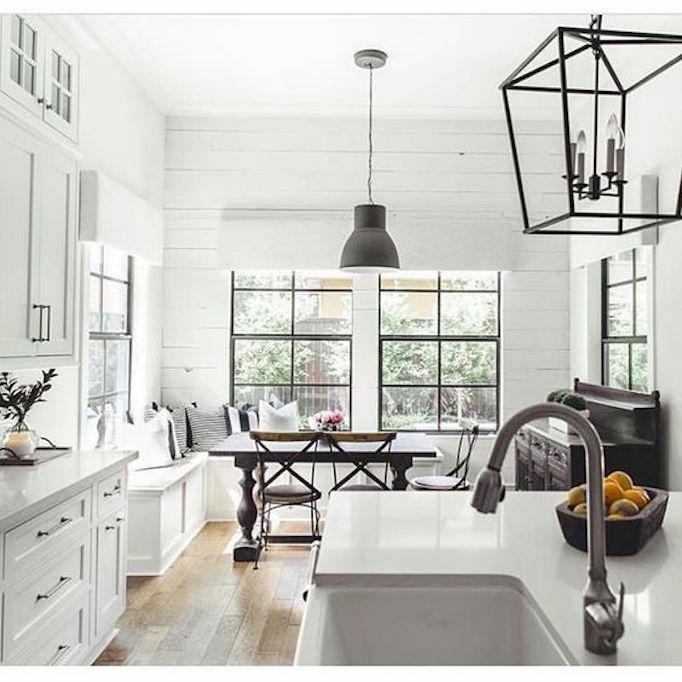 There are many variants of whites - like Cottage White or Simply White - that won’t run up the bill, and each have that unmistakable farmhouse charm. I can just imagine the delicious smell of a homemade apple pie fresh from the oven on that table! Comfort Grey: Above is a beautiful example of a farmhouse grey. 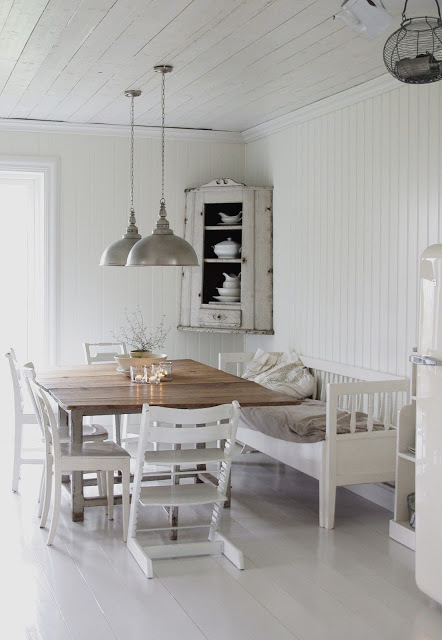 This grey goes perfectly with the brilliant white furniture, a staple of the modern rustic style. While more expensive than a gallon of off-white, it immediately creates a soft, cozy atmosphere where you can snuggle up on the couch to enjoy some herbal tea and a good book. Svelte Sage: If you need a pop of color, this fantastic green will look wonderful paired with a white trim, as in this photo, and black or brown accents against the wall tie it together neatly - and professionally - and makes you feel as if you’ve just come in from tending your peach orchard. This cool, calming green instantly soothes me when I see it. If you need a bit more of a relaxing atmosphere in your home, natural farmhouse colors are your best bet! Not only does it have that fixer-upper feel to it, it has that down-to-earth quality that always seems to slow down life, even if it is just relaxed at home. But that’s where we need that most, isn’t it?